INPhINIT-Incoming: There are 35 phd fellowships directed to students NOT having resided in the country of the host institution for more than 12 months in the last 3 years. Focused on STEM disciplines. If selected, students should join a Research Centre accredited with a Spanish or Portuguese Seal of Excellence (as Severo Ochoa, María de Maeztu, etc). Deadline: 6/02/2019. INPhINIT-Retaining: 30 phd fellowships to develop the doctorate in any field and any center in Spain or Portugal. Requirements: have resided in the country of the host institution for more than 12 months in the last 3 years. Deadline: 27/02/2019. INPhINIT fellowships have a duration of 3 years and are foreseen to start by October 2019; they offer a competitive salary, interdisciplinary training activities, short stays, a mentoring programme and dissemination and socialization activities. If interested, you may contact us at campus.theorygroup@uam.es to widen information on the research projects offered. Ya está abierto el plazo de inscripción en la edición 2017 del curso sobre “Programación paralela con OpenMP y MPI”, organizado por el Centro de Computación Científica de la UAM y el Centro Nacional de Supercomputación (BSC-CNS), y patrocinado por la Cátedra UAM-Fujitsu. Tendrá lugar en la Facultad de Ciencias, ente el 2 y el 8 de noviembre de 2017. Aunque el curso es gratuito, es necesario inscribirse siguiendo las instrucciones indicadas en esta página , donde podrá encontrarse además el programa completo del curso. La fecha límite para inscribirse es el 16 de Octubre de 2017. Dado el carácter eminentemente práctico del curso, se espera que los asistentes tengan conocimientos previos en el uso de OpenMP y MPI. Para aquellos interesados que no cumplan este requisito se ofrece, como novedad, la posibilidad de acceder a un curso de “Introducción a la programación paralela con OpenMP y MPI” que tendrá lugar entre el 2 y 6 de octubre de 2017 en el CCC-UAM (más información aquí). ATENCIÓN. La fecha límite para inscribirse en el curso de iniciación a la programación paralela es el 21 de septiembre de 2017. Fernando Martín, Full Professor at the Chemistry Department of the Universidad Autónoma de Madrid and researcher at IMDEA-Nanociencia, has been awarded the King Jaime I Prize in Basic Research in its 2017 edition. The jury has recognized his role in the establishment of the theoretical foundations of attochemistry. This emerging scientific field aims at observing and manipulating the electronic motion in atoms and molecules in their natural time scale, the attosecond (10-18 seconds), so as to control the chemical properties of substances and modify their natural behaviour. Although the first steps in this new scientific field date back only a decade ago, it is expected to become a multidisciplinary tool with numerous applications in chemistry, physics or biology, for example, to control the evolution of a chemical reaction, obtain images of charge transfer processes in individual molecules or influence the biological response to radiation, whether desired or undesired. The demonstration that attosecond science can have a large impact in chemistry came in 2014, when, with the help of sophisticated computational modelling, it was shown (Science 346, 336) that experiments in which the amino acid phenylalanine is irradiated with attosecond laser pulses are indeed able to monitor the movement of electrons, and hence to modify the properties and chemical behaviour of the molecule. According to the award-winning, the next steps in this field point to the use of attosecond techniques to prevent undesired chemical reactions, as those biological processes leading to adverse effects or, conversely, to induce chemical reactions that are currently impossible, which could lead to the production of new substances or materials. According to a recent article (Chemical Reviews, DOI: 10.1021/acs.chemrev.6b00453), the measurement and control of electronic motion in complex molecular structures is a formidable challenge that must be tackled in a multidisciplinary way, including intensive theoretical modelling in supercomputers, and may have a strong impact In chemistry for years to come. The Rey Jaime I Award recognizes researchers whose work is highly significant and has been developed for the most part in Spain. Throughout its 28 editions, it has been awarded to more than 100 researchers, the most important figures of the scientific, technological and entrepreneurial world of Spain. Many of the winners have received, during their careers, other relevant national and international awards. Fernando Martín was born in Madrid, Spain, in 1961. He graduated in Chemistry in 1984 and Physics in 1986 at the Universidad Autónoma de Madrid. He received his Ph.D. at the same university in 1986. He completed his postdoctoral studies at the University of Bordeaux (1988), the Université de Paris VI (1989–1990), and the Univesity of Chicago (1995–1996). He has been Full Profesor at the Universidad Autónoma de Madrid since 2005. He obtained the national research price Rey Juan Carlos I on 2000 and the prize of the Spanish Royal Society of Chemistry in 2010. He is currently Chair of the “Cátedra UAM-Fujitsu” on Scientific Computing and Big Data. His research focuses on the theoretical modelling of photoexcitation and photoionization of atomic and molecular systems induced by synchrotron radiation and ultrashort laser pulses, as well as that of complex molecular systems, isolated or deposited on surfaces. He has published almost 400 articles, and since 2011, he has been the recipient of an Advanced Grant of the European Research Council to lead a project focused on the development of computational tools for the study of processes that occur in the femto- and atto-second timescales (XCHEM). In the last years, his research group (https://campusys.qui.uam.es/) has attracted significant funding from the European Union (projects ERC-AdG- 290853 XCHEM, COST Action CM0702, MCA-ITN- 264951 CORINF y MSCA-EJD-642294 TCCM, MCA-RIG- 268284 ATTOTREND) and national programs funded through MICINN, MINECO and the AEI (projects FIS-2016-77889-R, FIS-2013-42002-R, FIS-2010-15127 and PIM2010EEC-00751-ERA-Chemistry), which has allowed him to establish what is perhaps the reference research group in Europe in the area of “Theoretical Attochemistry”. A two-years postdoc position is available in the group of Prof. Fernando Martin. The position shall be co-financed by the European Social Fund under the 2016 call for the recruitment of post-doctoral researchers of the Madrid region (more details here). The successful applicant shall develop an open project which aims to develop computational tools either for the description of ionization processes (for complex molecules, surfaces or nanostructures), the description of heterogeneous catalysis or materials synthesis. The CAMPUS group at the Chemistry Department of the Universidad Autónoma de Madrid is focused on the theoretical study of the dynamics in isolated quantum systems (from the smallest to medium-sized systems, or extended ones) and the development of state-of-the-art theoretical tools which can help us to understand their properties and predict their behavior. We seek for a post-doctoral researcher with a strong background in any of the group research lines (laser-matter interaction, surfaces or clusters) who complies with the set of restrictions listed below. Starting date: Expected start date is March 01, 2017. The position should normally start within one month from the publication of the resolution of the call here: http://www.madrimasd.org/madrid-ciencia-tecnologia/convocatorias-dgui/convocatorias-2016. Remuneration: Gross annual salary (before applying national income taxes and social security contributions) amounts to roughly 26.500 €. Researchers may receive additional funding to support the expenses derived from research missions and the attendance to international conferences. Previous experience in any of the areas of interest. a proof of being registered in the National Youth Guarantee system or proofs of being in a position to be a beneficiary of the said system. All the documents must be sent in a single pdf file named as the candidate plus the research line he/she is interested in (e.g. SURNAME_NAME-reserach_line.pdf). Applications not following this procedure will be disregarded. This call is co-financed by the European Social Fund through the Youth Employment Operational Program for the 2014-2020 programming period, as well as the Youth Employment Initiative (YEI). A short term postdoc position for an experienced researcher is available to work on coupled electron and nuclear dynamics induced by attosecond laser pulses and strong electromagnetic fields on small and mid-size molecules . The applicants should hold a PhD in Chemical Physics and at least 3 years of postdoctoral experience. A strong and demonstrable background in atomic, molecular and optical physics, attosecond physics, scattering theory, numerical methods, and programming is also required. The two-months postdoc position should start as soon as possible and, in any case, not later than January 16, 2017. Application procedure: Interested researchers should send a detailed CV, motivation letter and contact information for 2 references (in a single pdf file named as the candidate) to xchem.positions (at) uam.es. Recommendation letters and further information could be requested during the selection process. Applications shall be reviewed as they come. Selected candidates shall be contacted for an interview. Irradiation with pulses of infrared light of fullerene ions embedded in liquid helium nanodroplets has revealed transitions between the solid, liquid and superfluid phases of the helium layers surrounding the charged fullerene. The accuracy of these measurements, performed in an environment similar to that found in interstellar space, confirms the presence of fullerenes in space and opens the door to the characterization of diffuse interstellar clouds associated with other species rich in carbon. Helium nanodroplets provide a unique tool for the study of properties of molecules under conditions similar to those found in interstellar space: low temperatures and almost total absence of interaction with the environment. The latter is the consequence of the superfluidity of liquid helium, which prevents embedded molecules to experience any friction when they move inside. However, the introduction of charged molecular species inside these nanodroplets produces substantial modifications in the latter, especially in the first layers of solvation around the charged molecule. 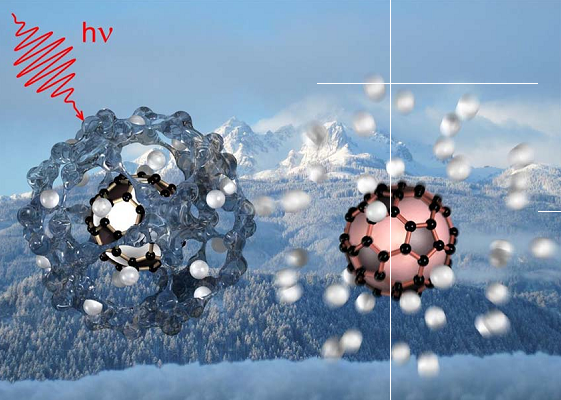 Using photoelectron spectroscopy techniques in combination with molecular dynamics calculations, the properties of the first helium layers that form around the C60+ fullerene have been studied in the framework of a wide international collaboration involving researchers from Universidad Autónoma de Madrid, IMDEA-Nanoscience and IFIMAC Condensed Matter Physics Center. The results demonstrate the appearance of phase transitions in the first helium layers as the number of helium atoms increases. In particular, it is observed a transition from a solid phase of helium (usually referred to as the “Atkins snowball”, see figure), to a liquid phase, when the second layer begins to form, and finally to the superfluidity phase. All this happens before reaching a hundred helium atoms. The precision required to reveal such changes is of the order of 0.05 nanometers, which explains why such phenomena have gone unnoticed to date. Given the insulation and low temperature environment provided by helium nanodroplets, the method has confirmed the assignment of two diffuse interstellar bands (DIB) to the presence of the C60+ ion in space, which demonstrates the important role of fullerenes as a carbon reservoir in the universe. The work published in the journal Nature Communications shows that, with the accuracy achieved in this study, the absorption spectra of other astrophysically relevant species can be determined, such as smaller fullerenes, polycyclic aromatic hydrocarbons and their derivatives. Figure 1. The measurement principle. Fullerene C60+ (whose carbon atoms are represented by black spheres), surrounded by an “Atkins snowball” formed by a layer of helium atoms (transparent spheres surrounding the C60+), is irradiated by a laser pulse of infrared light, which leads to the evaporation of helium atoms. The wavelength of the absorbed light depends on the number of helium atoms initially adsorbed on the C60+. A new edition of the course on Parallel Computing will be held next November 2nd, 2016. 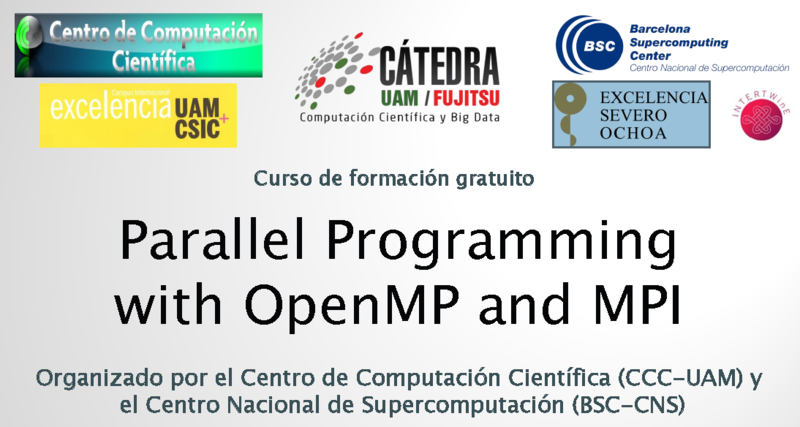 The goal of the course is the understanding and practice fundamental concepts about parallel programming with OpenMP and MPI. A Consortium of 12 European Universities and 14 associated partners, including 9 private companies, under the coordination of the Universidad Autonoma of Madrid, offers 15 fully-funded 3-year PhD fellowships within the European Joint Doctorate Program in Theoretical Chemistry and Computational Modelling (EJD-TCCM), funded under the framework of the Innovative Training Networks of the Marie Sklodowska-Curie Action ITN-EJD-642294. TCCM. A detailed list of the projects and the institutions involved can be consulted on our website. A 3-year European Joint Doctorate with cross-disciplinary thesis research in a stimulating, international scientific environment. Supervision and mentorship by a team of internationally renowned experts. Advanced training (scientific, transferable skills, career orientation) opportunities in English. Applications must be submitted online at our website. Deadline: 15th April 2015. PhD projects start in summer/autumn 2015. We look forward to hearing from you! The Universidad Autónoma de Madrid (UAM) offers several postdoc and PhD positions linked to the ERC Advanced Grant project X-Chem (XUV/X-ray lasers for ultrafast electronic control in molecules), starting no later than September, 2015. The successful applicants shall develop a research project on “Theoretical Attosecond Molecular Dynamics” to theoretically investigate the coupled electron and nuclear dynamics induced by attosecond laser pulses and strong electromagnetic fields on small and mid-size molecules. The work will be performed in close collaboration with experimental groups. Prospect candidates must have an adequate degree in Physics or Chemical Physics and strong background in atomic, molecular and optical physics, attosecond physics, scattering theory, numerical methods, and programming. Transnational mobility will be positively evaluated. Interested candidates are kindly requested to check all details about the application procedure for PhD positions and post-doc positions. Applications not complying with the call guidelines may be discarded. A one-year postdoctoral contract is available in the Campus group.The aim of the project is to develop a theory for the description of dynamical processes involving energy and charge transfer in molecule-surface interactions. The project involves the use state-of-the-art methodologies to study these complex processes in periodic systems. The postdoc position will start between March 1st and June 1st 2015. The deadline for applications is February 1st 2015.